Click here to schedule your complimentary consultation. 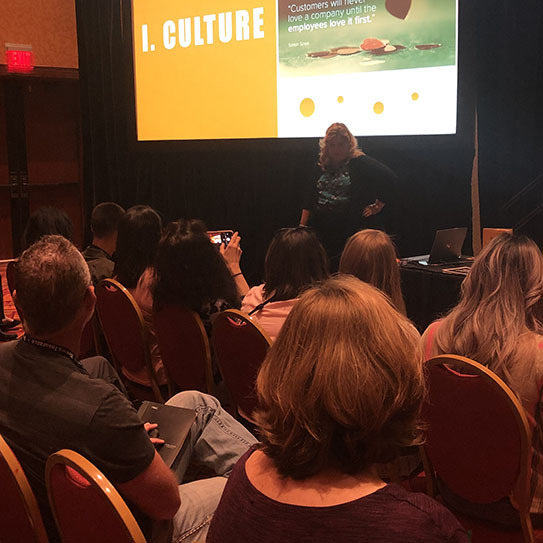 RECENTLY, ANTIOCH ORTHODONTIST Dr. Ann Marie Gorczyca was a guest speaker at the Western Regional Dental Experience 2019 conference in Glendale, Arizona. During that conference, Dr. Gorczyca once again realized something she had forgotten, which is that some people are not sure how to pronounce her name! To make it simple for everyone, Dr. Gorczyca likes to say, “It’s Gor-si-ca, like the island of Corsica.” Corsica is an island in the Mediterranean Sea, just to the southeast of France. Most people have heard of it and it is easy to spell and pronounce. 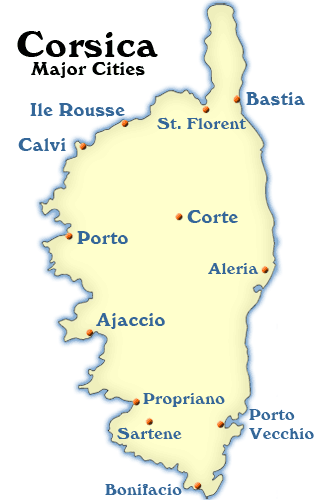 Corsica is most famous for being the birthplace of Napoleon Bonaparte. In the past, Dr. Gorczyca has also said, “It’s Gorsica, like the Chevy Corsica” if you remember that model of car. In any case, with Gorczyca, just replace the “czy” with “si” and you’ve got it! We are thankful that our patients, family, and friends in the Antioch, California area have heard orthodontist Dr. Ann Marie Gorczyca’s name so many times that they just know how to say it. Dr. Gorczyca has been offering orthodontic services, braces, Invisalign, retainers, and all orthodontics services in East Contra Costa County at Gorczyca Orthodontics since 1996. Find us at 5201 Deer Valley Road, Suite 1A in the Deer Valley Dental Professional Building, right behind Deer Valley High School. Reach us at 925-757-9000. You don’t need to speak Polish to say Gorczyca. 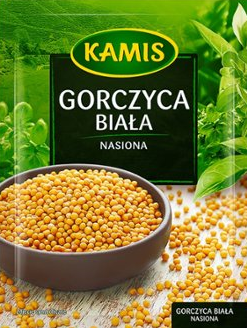 And by the way, Gorczyca means “mustard seed” in Polish! Thank you for choosing Gorczyca Orthodontics. Your smile is our inspiration. What’s Stopping You From Getting Braces? MANY ADULTS MISTAKENLY believe that they missed their chance to get braces because they didn’t have them as teenagers. However, the number of adult orthodontic patients has risen dramatically over the last few decades, and today we’re going to debunk all of your excuses for not getting braces and show you why orthodontic treatment is still a wonderful option for adults with dental alignment issues. It may be preferable to start young for orthodontic treatment, but there is no age limit to getting a straighter smile. We can help determine the best treatment for your circumstances. One advantage adult orthodontic patients have over teens is the self-discipline that comes with maturity; adults will often be better at following instructions for their treatment, which means it will go much smoother. If you’ve been living with crooked teeth your whole life, you might think there’s no point in getting orthodontic treatment. But having straight teeth isn’t just about appearances — it’s also about improved oral and overall health. Straight teeth are easier to clean and make it easier to speak, chew, and even breathe effectively, whereas crooked teeth cause difficulties in all of these areas and can grow more crooked over time. Some adults who would like straighter teeth may still hesitate to seek orthodontic treatment because they worry that spending a year or longer in braces could impact their personal lives or careers by making them look immature or unprofessional. Luckily, there are several low-profile orthodontic treatment options for patients who don’t want to broadcast their treatment to the world, such as invisible aligners, clear ceramic braces, and lingual (tongue-side) braces. 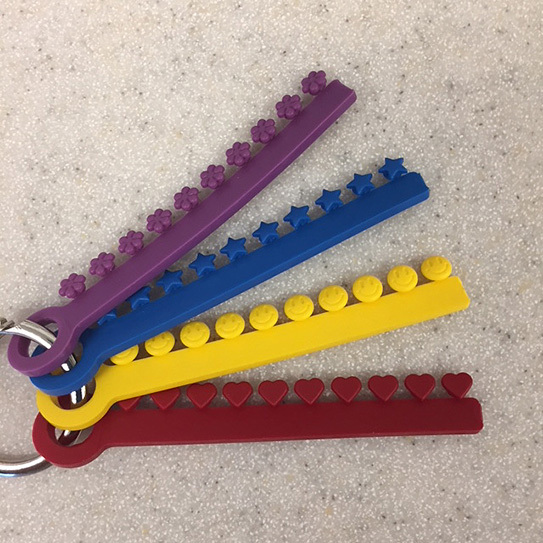 With these, you can straighten your teeth without anyone noticing your hardware! Orthodontic treatment can certainly cost more than a regular dental appointment, but it’s also an investment in your future, saving you from the expenses of problems that come with crooked teeth or a bad bite. If you aren’t sure you can fit braces into your budget, schedule a consultation with us. Together, we can find the best and most affordable option for you. Leave crooked teeth behind. Call us today start your orthodontic treatment. No more excuses! You will love your new smile! Your smile is our inspiration. Please call Gorczyca Orthodontics in Antioch, California at 925-757-9000 to schedule your complimentary orthodontic exam. Find us at www.clubbraces.com. Together, we can make braces affordable for you. We also offer CareCredit long term financing with no down-payment and OrthoCalc sliding scale 0% financing. Don’t let excuses keep you from your dream smile! WE UNDERSTAND THAT we’re your orthodontic practice, not your general dentist. However, as one of your lifelong health partners, we’re concerned here at our practice about your complete oral health. That’s why we feel like it’s important to provide relevant and useful information that’s often not orthodontics specific. Did you realize that women have special challenges when it comes to oral health? Hormonal cycles can affect the way women’s bodies react to bacteria and plaque inside their mouths. If you’re a woman — or if you’d like to pass this information along to a woman who could benefit from it — our team encourages you to learn more about these important dental facts. Puberty, pregnancy, and menstruation cause increased progesterone and estrogen levels, which can lead to increased gum sensitivity. There’s also a condition known as menstruation gingivitis, which can cause some women to experience increased bleeding and swollen gums right before menstruation. This condition is typically not serious and clears up quickly. Gingivitis during pregnancy can be more severe, and may even cause non-cancerous oral tumors. That’s another reason why it’s important for women to keep their regular checkup appointments with their general dentist during pregnancy. Oral contraceptives also increase hormone levels in women’s bodies, which can cause increased sensitivity and vulnerability to gum disease. During menopause, hormonal fluctuations can also create oral health problems including dry mouth syndrome, which can significantly add to a woman’s tooth decay risk. Women are almost twice as likely as men to be diagnosed with TMD (Temporomandibular Disorders). TMD causes strain on one’s jaw joint and potential damage to teeth, often as a result of clenching and/or teeth grinding. HPV is becoming more common, and research is increasingly suggesting a link between HPV and oral cancer. Regular oral cancer screenings are important whether or not a woman has high risk factors. Women are much more susceptible to osteoporosis than men, which can cause jaw bone loss and associated periodontal disease problems. The Great News? Women Take Better Care Of Their Oral Health! If you are a woman and you have questions about your oral health, please visit us at Gorczyca Orthodontics in Antioch, California. Call us at 925-757-9000 to schedule your complimentary exam. Visit us at www.clubbraces.com. If we don’t have the answer, we’ll go out of our way to point you in the best direction to find the answer! There are lots of easy ways to connect with us — and we promise to be very responsive! You can make a comment below, or even connect with us on our Facebook page. Women need to take time to care for themselves and their oral health. Your smile is our inspiration. 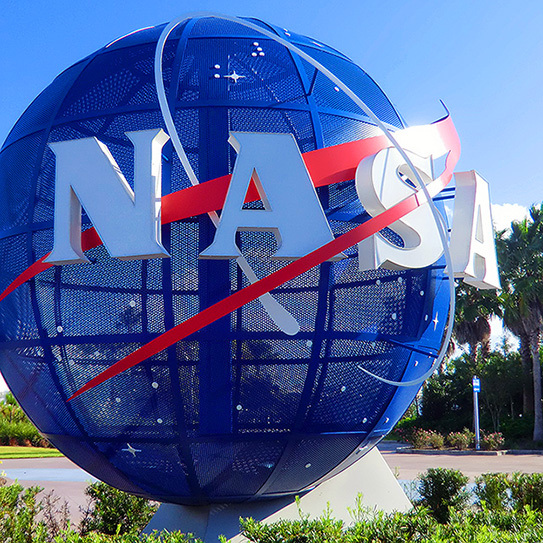 WHAT DOES NASA HAVE TO DO WITH YOUR BRACES? Probably more than you think! The braces of ages past are gone. Modern treatment includes everything from advanced digital imaging to metal alloys created for space travel. These amazing technological advances mean that your treatment is more comfortable, less conspicuous, and more efficient. All orthodontic treatment starts with a plan of action for your ideal smile. New scanning technology lets us fully envision that plan before ever putting a bracket on a tooth! Comprehensive orthodontic scanning gives us a detailed look at the skull’s structure and underlying problems in the mouth and jaw. Using this information, we’re able to create a complete picture of your bite and plan the movement of teeth. Better imaging means better planning and more efficient treatment for YOU. Years ago, archwires on braces were made from stainless steel. This inflexible metal created a dramatic push right after tightening (effective, but sometimes uncomfortable) but didn’t continue corrective pressure after a few days. Now, we use nickel titanium wires. This memory-wire produces very gentle, gradual, and continued pressure as it strives to regain its set shape. What does this mean for you? It means braces are much more comfortable, and yet they move your teeth more between tightening appointments, which makes your treatment time faster! What Does the Future Hold for Orthodontics? The possibilities are endless! It may be very soon that you come in for a checkup and get your retainer 3D printed within the hour. Perhaps computerized, self-adjusting brackets will allow us to monitor your treatment remotely! Whatever happens, you can be sure we’ll be there to see if it can better help us give you the smile of your dreams. Call us at Gorczyca Orthodontics if you have questions about limited treatment or short term orthodontic treatment with NiTi wires (925) 757-9000. Find us at www.clubbraces.com. Visit us at 5201 Deer Valley Road in Antioch, right behind Deer Valley High School, for a complimentary orthodontic exam. Thank you for choosing Gorczyca Orthodontics. Your smile is our inspiration! Top image by Flickr user Reinhard Link used under Creative Commons Attribution-Sharealike 4.0 license. Image cropped and modified from original. BE NICE TO YOUR braces this holiday season. Be sure to eat holiday treats that are soft and braces-friendly. Hard candies are on the braces naughty list. 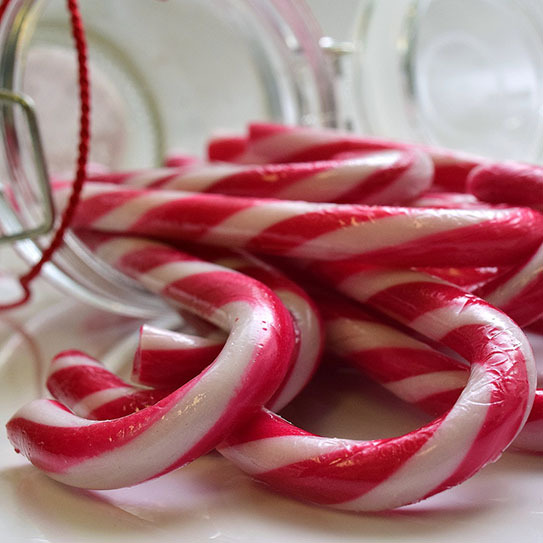 These include candy canes and all hard candies. Gum and chewy, sticky candy are also on the braces naughty list and could lead to an orthodontic emergency. Soft candies, including chocolates, and easy to chew candies like Almond Joys or Mounds bars, are much safer to eat. Be sure Holiday gift box chocolates are soft. Stay away from the sticky chewy ones. To ensure braces safety when eating mystery chocolates, you may need to cut your gift box candy in half to see what lies inside before you take a bite. Small, soft M&Ms that can be chewed with the back teeth are on the nice list. Most desserts, including ice cream, cakes, and brownies and can be easily enjoyed with braces. If you really want to impress Santa with your braces niceness, eat the Holiday Jello! This will put you at the top of the braces nice list! Keep Taking Care Of Those Teeth! Be sure to brush and floss your teeth regularly and frequently during the holiday season. 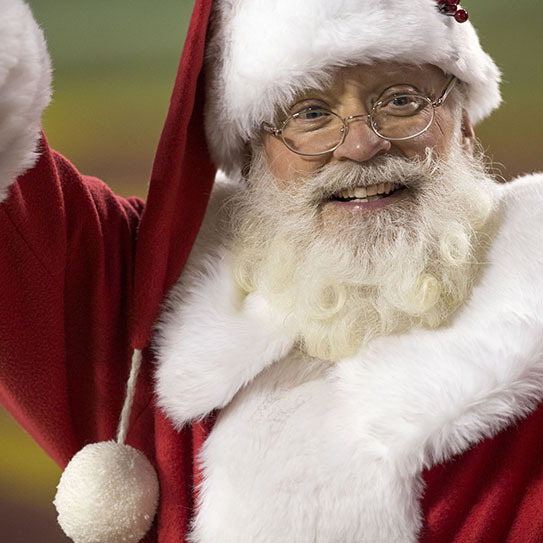 This will put you on the nice list not only with Santa but also with your orthodontist. We wish you a joyful holiday season without any orthodontic emergencies. Merry Christmas and happy New Year from all of us at Gorczyca Orthodontics. Gorczyca Orthodontics, 5201 Deer Valley Road, Suite 1A, Antioch, California (925)-757-9000. WE VALUE EVERY FUTURE patient who comes to Gorczyca Orthodontics in Antioch, California for a complimentary orthodontic exam. Once you’re on our list, you are never forgotten. If you’re on our list, you’ll be happy to know that unlike Santa, we’re checking it more than twice! You will be receiving personal phone calls and other communication from our office to check in and see how you are doing and how you are feeling about getting started on your beautiful smile. It’s Never Too Late For A Beautiful Smile! 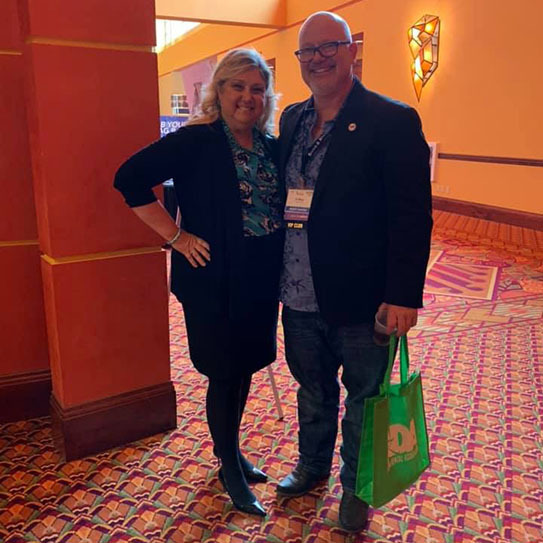 Recently, Dr. Gorczyca reconnected with an initial exam patient who came for his orthodontic exam nine years ago and finally started Invisalign treatment! We understand that it takes some people longer than others to make the important decision to start orthodontic treatment. That’s why we stay in touch and continue to give you attention, encouragement, and information regarding the process of orthodontic care. 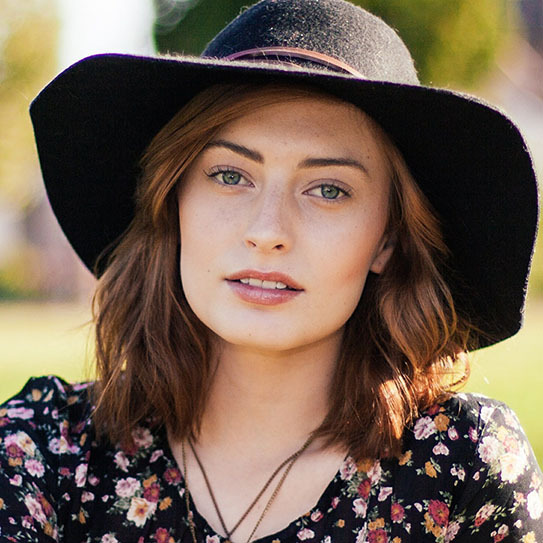 One thing’s for sure: once you make that life-changing decision to straighten your teeth, align your bite, and improve your facial profile, you will not regret it! 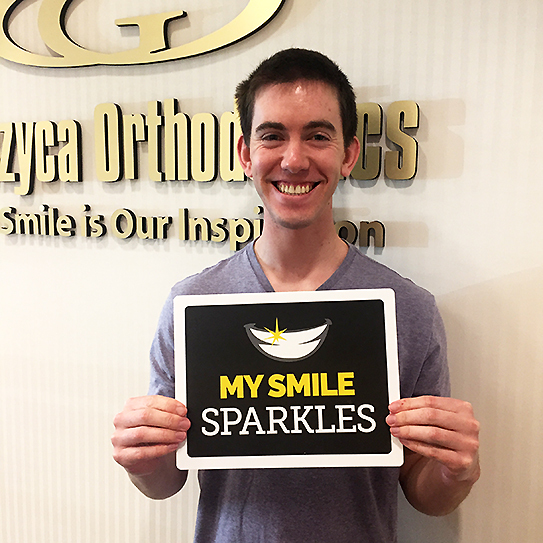 We at Gorczyca Orthodontics continue to be inspired every day by the transformations that we see and the happiness and confidence that a new smile brings to our patients’ lives. We are honored to be part of your new smile journey. We hope that you will consider giving yourself the gift of a beautiful smile this Christmas or in the year ahead. Call us at Gorczyca Orthodontics in Antioch, California at (925) 757-9000 if you have questions about braces, Invisalign, retainers, or your smile. Find us at www.clubbraces.com. Santa can’t give you a beautiful smile for Christmas, but we can! If you have procrastinated regarding your orthodontic care, we hope that you will start it soon. Happy Holidays from all of us at Gorczyca Orthodontics. Your smile is our inspiration. Top image by Flickr user Keith Allison used under Creative Commons Attribution-Sharealike 4.0 license. Image cropped and modified from original. SOMETIMES UPPER FRONT TEETH don’t come in on time. If more than one year passes since the expected time of arrival of an upper front tooth, usually at age 7, and the front tooth is still delayed, it’s time to take action and visit an orthodontist. There are many possible causes of delayed permanent front teeth. 1. A baby tooth may be lost too early due to a cavity or an accident. When this happens, bone and tissue fills the tooth path and the permanent tooth may not be able to push its way out. 2. A baby tooth can be maintained too long. A baby not loose and firmly in place too long may not allow a permanent tooth to come in or may cause the permanent tooth to come in out of place. 3. An extra front tooth in the middle of both front teeth can prevent these front teeth from coming in. This extra middle tooth is called a mesiodens. Sometimes this tooth comes into the roof of the mouth or it may stay stuck in the bone. 4. Front teeth may be deformed, turned sideways, or even upside down. This situation will require a surgical procedure and attachment of a metal chain to pull the tooth into position with braces. Get An Orthodontic Evaluation By Age 7! In all of these situations, orthodontic space preparation is important. In some cases, a surgical incision may be all that is necessary to release a front tooth and allow it to come into position. 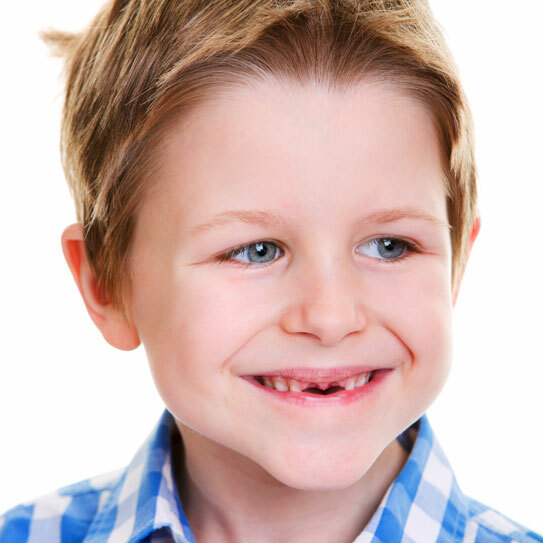 The esthetic and social consequences of a missing front tooth for a child are significant. This is why the American Association of Orthodontists recommends that every child have an orthodontic evaluation by age 7. AS MUCH AS WE LOVE YOU, once you’ve completed your orthodontic treatment, we don’t want you coming back for re-treatment! So remember to faithfully wear your retainer! Some people neglect this last stage of their orthodontic treatment. It’s probably because they think that once their braces are off, they’re FINISHED with orthodontics. Sorry to break it to you, but you’re not done just yet. In fact, maintaining that drop-dead gorgeous smile may be a lifelong pursuit. Once you get your braces off, you need to remember that your retainer is the final phase of orthodontic treatment, and it’s just as important as every other phase. Just as you brush your teeth to prevent decay and bad odors, you’ll need to brush your retainer. Use a toothbrush and toothpaste. Some people like to use a tiny bit of mouthwash, or dish detergent. That’s fine, just remember to rinse well. Remember to clean regularly — every day or so. This will prevent buildup. And a special note: DON’T put your retainers in the dishwasher or the microwave. That’s just asking for damage and warping. Always carry your retainer case with you so that you can properly store it while eating. Never wrap up the retainer in a napkin or tissue. That makes it look like trash, and it’s easy to accidentally throw away. IF YOU DO lose your retainer, contact us right away. We can make you a new one before your teeth start misbehavin’. In most cases, after your braces are removed, you should wear your retainer ALL the time (unless we tell you differently). After that, continue to wear your retainer EVERY night. We’re so excited when our awesome patients reach this final phase of treatment. Take good care of your retainer, and enjoy your beautiful new smile for life! If you have lost or broken your retainer, please call us at Gorczyca Orthodontics in Antioch, California for a complimentary orthodontic consultation (925) 757-9000. We want you to have straight teeth for life! Your smile is our inspiration. Top image by Flickr user Braden Kowitz used under Creative Commons Attribution-Sharealike 4.0 license. Image cropped and modified from original. IT’S THAT TIME AGAIN; the time of black cats and carved pumpkins, the time of ghouls and goblins, the time of costumes, parades, and parties. 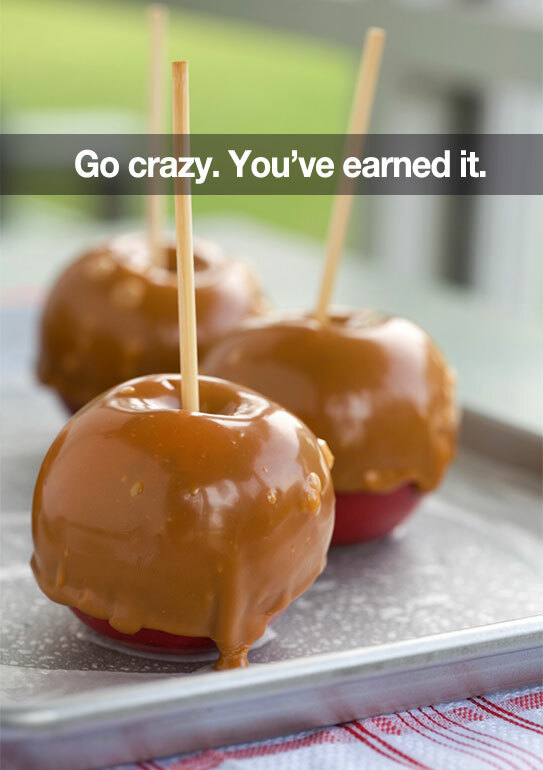 It’s time for all of those things, and it’s also a great time for healthy Halloween snacks! Here are a few Healthy Halloween snack ideas that are also good for oral health and braces. Finger sandwiches. Freeze your bread and then cut it with a cookie cutter into Halloween figures. Use soft and healthy spreads like peanut butter and jelly, hummus, or guacamole. Guacamole makes a great green Frankenstein on an open faced sandwich. Cheese cut-outs. Those Halloween cookie cutters work great on cheese slices too! Banana ghosts. Banana ghosts on a stick are so easy to make. Simply peel a banana, cut it in half, and add chocolate chips for a mouth and eyes! Tangerine pumpkins. Clementine tangerines are so easy to peel. Then add a snap pea pumpkin stem for a bit of color. Watermelon monster. Why carve a pumpkin when you can carve a watermelon? 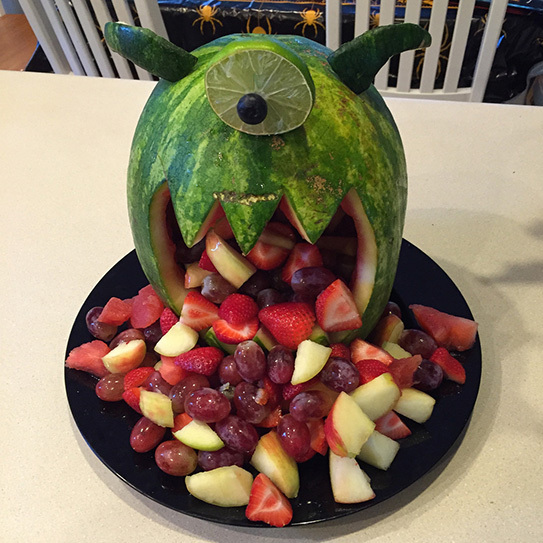 Your watermelon monster will make a great centerpiece for a spooky fruit platter. Apple slice mouths. Tiny marshmallows make great teeth between apple lips. Use peanut butter to hold the marshmallow teeth in place. Strawberry faces. Dip strawberries in either yogurt or white chocolate to make funny faces. Chocolate chips, sprinkles, and grape bits can be used to accessorize. Frozen pops. Why eat candy corn when you can have a giant frozen pop with white yogurt, orange juice, and pineapple juice. Yum! Scary deviled eggs. Hummus can be used to make a brown center for spiders. Black olives can be used to make spider legs. Or you can make egg eyeballs with an olive center. Add a little red pepper for a scary bloodshot look. Halloween is a time of creativity and fun. So get creative and bring on the healthy treats! It’s time for oral health and a great time for wishing you a Happy Halloween! Gorczyca Orthodontics, 5201 Deer Valley Road, Suite 1A, Antioch, California 925-757-9000. Top image by Flickr user Scott McLeod used under Creative Commons Attribution-Sharealike 4.0 license. Image cropped and modified from original. DENTAL PRACTICE SOCIAL MEDIA is here to stay, and for us at Gorczyca Orthodontics, it all started with Facebook. Since our Gorczyca Orthodontics Business Facebook started over ten years ago, it has been all about YOU, our valued patient! Find your favorite Gorczyca Orthodontics photo of you, your family, friends, or members of the greater Antioch, California community on our Gorczyca Orthodontics Facebook page. Our Gorczyca Orthodontics Blog provides concise bits of information about our practice, team members, dental health, and facts and tips that will help you on your orthodontic journey. We hope that you find this content interesting. Our Gorczyca Orthodontics Facebook page will list special practice days and offers and include contest, events, and offers related to braces, Invisalign, retainers, and teeth whitening. Patient appreciation events will also be listed. The coolest thing about connecting with us on our Gorczyca Orthodontics Facebook page is that through its honest, transparent, and spontaneous communication, you will get to know us better! You can always contact Dr. Ann Marie Gorczyca here or on her personal Facebook page, and you will receive almost an immediate reply. Social media is a great way to get in touch with your doctor! Social media and the iPhone have replaced the pager! Add Us On Facebook Today! So, take a moment to be our Gorczyca Orthodontics business Facebook friend. Thank you also for your 5 star reviews. We’re looking forward to seeing you soon, in person, at Gorczyca Orthodontics at 5201 Deer Valley Road in Antioch, California. Call us at 925-757-9000. Thank you for being our Facebook friend. Your smile is our inspiration! IT’S THAT TIME OF year again. October is the season of decorations and surprises as children pick out their costumes and look forward to trick or treating on Halloween. Are Halloween Color Ties A Good Idea? It’s also the season of orange and black braces color ties in orthodontic offices worldwide. 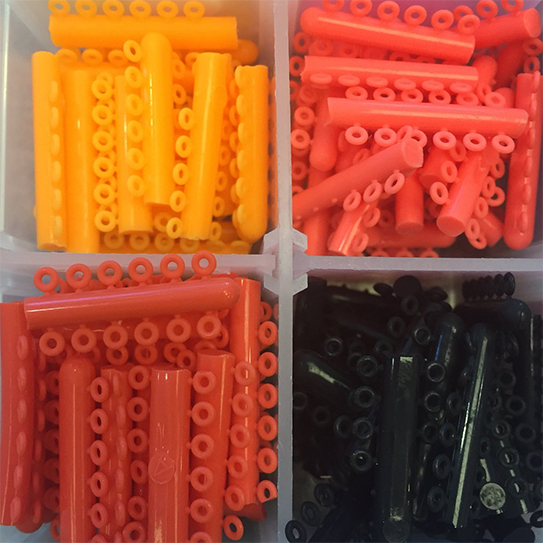 You can be sure that orthodontists everywhere are restocking their supply of these two colors for the Halloween season and the increased demand for orange and black elastics. But could you regret choosing these festive colors for your teeth and braces after the Halloween season? Remember, you may be wearing your Halloween color ties for up to eight weeks. So, if you have a school dance in November and you’re planning to wear blue, you may want to rethink your braces color tie selection for the future and plan ahead. At Gorczyca Orthodontics, no matter who you are or what your fashion situation is on Halloween or afterwards, we are available Monday through Friday to change your braces color ties in case of need or emergency. We want all of our patients to be happy. And we certainly don’t want your Halloween color tie selection to be your biggest life regret! THAT’S SCARY! Happy Halloween from all of us at Gorczyca Orthodontics. Gorczyca Orthodontics, 5201 Deer Valley Road, Suite 1A, Antioch, CA 925-757-9000. IT’S ONE OF THE most familiar images of the 20th century and one of the most famous paintings in the American art world. 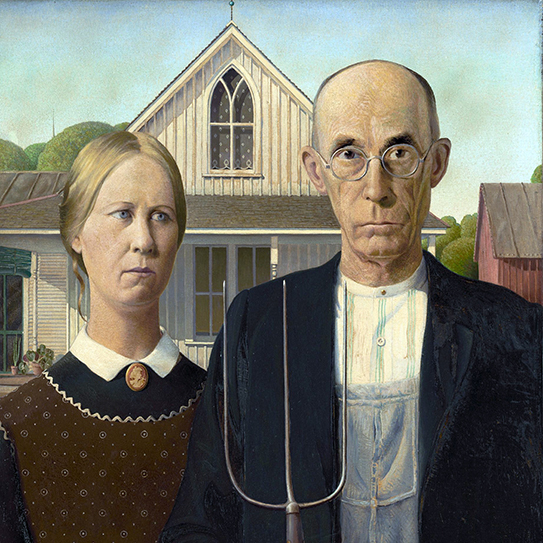 But did you know that the man depicted in Grant Wood’s iconic 1930 painting “American Gothic” is actually American dentist Byron Henry McKeeby? Dr. Byron Henry McKeeby was born in 1867 in Birchardville, Pennsylvania in Susquehanna County. He studied dentistry at the University of Iowa. He then stayed in Iowa to open his dental practice in the town of Winthrop. He moved to practice dentistry Cedar Rapids, Iowa in 1901. It was in Cedar Rapids that one of Dr. McKeeby's dental patients, Grant Wood, approached the dentist to ask him to model in his painting. 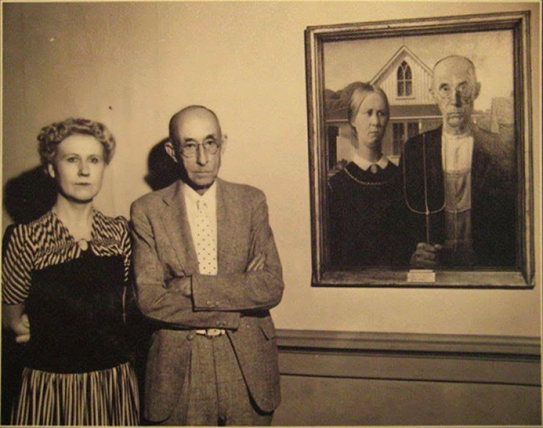 Artist Grant Wood had found a small white wood painted house of Carpenter Gothic style, the Dibble House, which he wished to paint with “the kind of people I fancied would live in that house.” Dr. McKeeby was one of these people, along with the artist’s sister, Nan. Dr. McKeeby held a pitchfork while the artist’s sister wore a colonial print apron to add a touch of 19th century Americana. Since Dr. McKeeby was 62 and Nan was 32, it is implied that Nan is the farmer’s daughter. Wood entered the painting in a contest at the Art Institute of Chicago, for which he won a $300 prize. The Art Institute of Chicago later bought the painting, making Dr. McKeeby’s face one of the most recognized in the art world. The painting still hangs there today. Thanks For Your Reviews And For Sharing Our Orthodontic Practice! HOW DID YOU FIRST BECOME our patient? Most of our patients find us through referrals from trusted friends, extended family members, neighbors, and coworkers. When it comes to something as important as orthodontic treatment, honest personal endorsements are usually the best guide. You know what’s really cool when a new patient comes to our office based on a referral? We know that referral originated from one of YOU — a valued patient we’re connected to and already serving. It’s the ultimate compliment for us and it makes US smile. During the early days of the internet, people searched online for an orthodontist by typing in their city name and the word “orthodontist.” But times have changed. Today, people look to trusted, permission-based social networks like Facebook and others to ask for their families’ and friends’ recommendations. That’s one of the reasons why we love social media so much... It makes it easy for our patients to share. 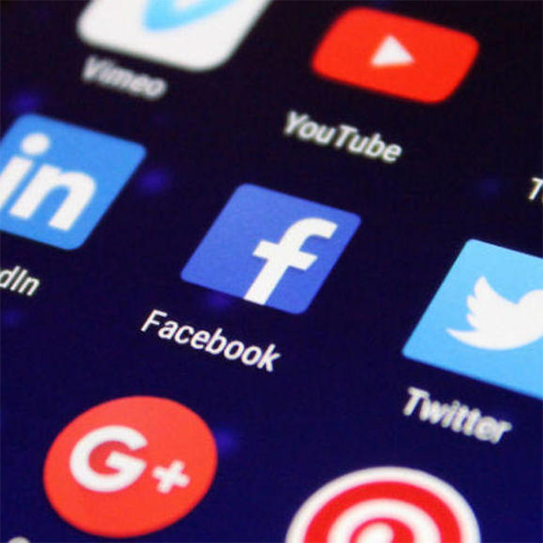 Then, social media makes it easy for those potential new patients to really get to know us — even before they walk through our door for the first time. Life is super busy. We understand, and we know we’re asking a lot. But when you DO have a minute, it’s always greatly appreciated. Our review page is a great place to share your impressions. And you can always go to our Facebook page to leave a comment, a recommendation, or to direct message us. You could also leave us a review on Yelp! So, what brought YOU to our practice for the first time? We’d love to hear! And ANYTIME we can do something to help make your visits even better, please let us know. Your feedback helps us continually improve and give the best service possible to our patients. Once you become a patient at Gorczyca Orthodontics, we consider you a patient for life. Thank you for joining our Gorczyca Orthodontics family. We look forward to seeing you again soon at Gorczyca Orthodontics. Your smile is our inspiration. IT’S PART OF GROWING UP: back to school, losing baby teeth, back to the orthodontist. From age 7 to age 18, your orthodontist will be an important part of your childhood. After orthodontic records, your orthodontic treatment will be started. The sooner you start, the sooner you finish! Keep Your Beautiful Smile For A Lifetime! This case was treated by Board Certified Orthodontist Dr. Ann Marie Gorczyca of Gorczyca Orthodontics in Antioch, California. Call us at (925) 757-9000 or visit us at www.clubbraces.com. To find an orthodontist in your area, visit the American Association of Orthodontists at www.mylifemysmile.com. Start the school year right! Here’s to your beautiful smile. BRACES REMOVAL DAY is the most exciting day of any orthodontic patient’s treatment, but it’s not where the story ends. Next come the retainers, to make sure that smile stays properly aligned. But how do we keep our retainers in good condition, and why are they so important? Why Do We Need Retainers? It would be nice if our teeth stayed exactly where our braces left them: perfectly straight for the rest of our lives. Sadly, this isn’t how teeth work. They are held in place by periodontal ligaments, and these ligaments take time to adjust to their new position. Neglecting your retainer allows those ligaments to tug those teeth back to where they were before you had braces! This is why it’s crucial not only to wear your retainer as directed, but to take good care of it. Removable retainers come in two basic varieties: Hawley (the classic retainer made of wire fixed to a fitted acrylic plate) and Essix (clear plastic retainers). The different types require slightly different approaches when it comes to cleaning. Make sure to follow these steps so that your retainer doesn’t become smelly and full of tartar deposits. A cheap and easy way to clean your Hawley retainer is by soaking it in baking soda water. Doing this every day would damage the soldered metal pieces, so it’s important to only do this once in a while. 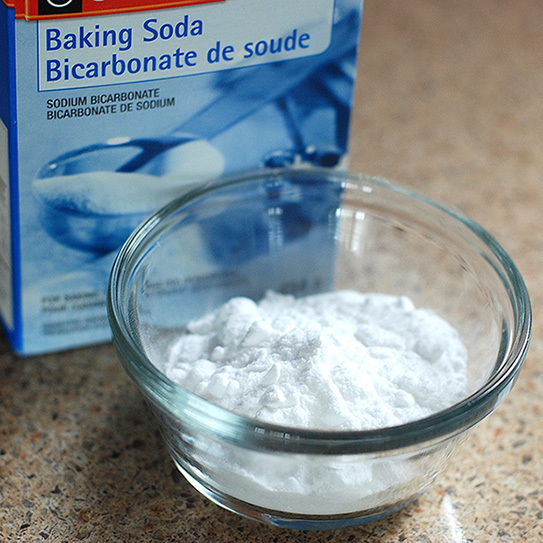 Baking soda is a safer solution than effervescent tablets, especially if you have allergies. You should also avoid using mouthwash, which can dry the acrylic out to the point of damaging it. It’s important to brush your Essix retainer as often as you brush your teeth — but hold the toothpaste, because it could scratch the plastic. Also make sure that the water you use to rinse it is lukewarm. Hot water will warp the retainer’s shape. Soaking in baking soda water is a great way to deep-clean an Essix retainer too, and there isn’t any metal solder to worry about, so you can do this as often as you like. These are great tips for cleaning removable retainers, but what if you have a permanent retainer — the kind cemented to the backs of your teeth? Easy! Just clean these the same way you kept your braces clean: diligent brushing and flossing. It can be tricky to floss around a permanent retainer, but it’s crucial for keeping tartar from building up around it and the backs of your teeth. Threaders and special floss designed for retainers can make this process easier, and you might even consider getting a water flosser if you don’t already have one. If You Need More Tips On Retainer Care, Just Ask! 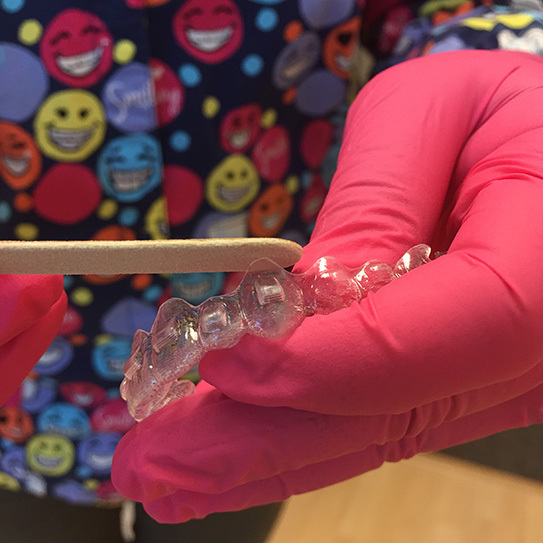 Whatever kind of retainer you use, you can always bring yours to our office or to your dentist for cleaning and inspection. We want to help you make sure that retainer lasts! If you have questions about orthodontics or retainers, please call us at Gorczyca Orthodontics at 925-757-9000 for a free orthodontic exam. ONCE YOUR BRACES are off, a tooth positioner is an excellent finishing device which you may want to add to your orthodontic treatment. What Is A Tooth Positioner? A tooth positioner can be used as a removable retainer under special circumstances. It has the advantages of being able to relate the upper teeth to the lower teeth in the ideal bite position, something that two separate retainers cannot do. A positioner also has the ability to close small spaces between the back teeth left by orthodontic bands. These spaces usually close up over a few months after braces are removed, but a tooth positioner can speed up this process. How Do Tooth Positioners Work? Tooth positioners are usually worn 4 hours per day when awake and during sleep. Actively biting into your tooth positioner when you wear it will help the tooth positioner work at moving your teeth. The force of your jaw will help move your teeth to their final position. A tooth positioner may be used to improve your bite, but they do not make good long term retainers. Positioners do not retain front teeth straightness long term as well as standard removable Hawley retainers. Tooth positioners are also bulking and take away your ability to speak. They are flexible and soft, similar to a mouth guard. If worn over a long period of time, the positioner will tend to tear and wear out. So once your positioner work is done, it’s good to receive and wear your final retainers. Who Should Use A Tooth Positioner? Overbite tends to increase with the wear of a tooth positioner. Tooth positioner use is desirable with mild open bites. 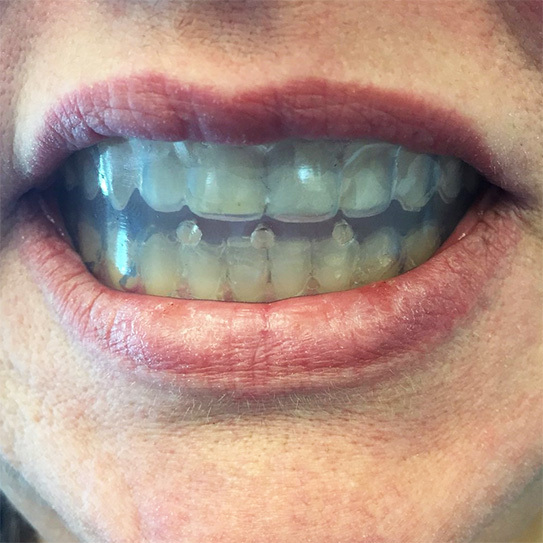 A tooth positioner may be beneficial at the end of Invisalign treatment where upper and lower teeth have been slightly separated by aligner wear and a slight open bite may exist at the end of treatment. Tooth positioners are usually not included in standard orthodontic treatment but may be beneficial to further perfect your bite after the braces come off. Like mouthguards, tooth positioners come in a variety of colors. There are even flavored tooth positioners. A short amount of time in a tooth positioner can make a big difference in your bite. Ask your orthodontist if a tooth positioner may be right for you. If your orthodontist recommends a tooth positioner, go for it. It will be well worth the short time and extra effort for a beautiful and more perfect bite. Bring Us Your Tooth Positioner Questions! If you have questions about tooth positioners, visit us at Gorczyca Orthodontics in Antioch, California. Call us at 925-757-9000 or visit us at www.clubbraces.com. NOW THAT YOUR BRACES are off, you’re ready to celebrate! Once again you get to eat those foods that you’ve missed so much! It’s easier to brush! And most of all, you get to show off your gorgeous smile to everyone who congratulates you for completing treatment! There are a few things that you need to remember about caring for your teeth after braces. For the most part, post-braces care is the same as pre-braces and during-braces care. That’s why we talk about so many general dental care and oral health topics here on our blog in addition to information about orthodontic treatment. HOWEVER, here are a few things specific to those of you who just had your braces removed. Schedule an appointment with your dentist. Now that your teeth are aligned and clear of hardware, your dentist can do a more thorough examination and cleaning. If you had crowded teeth before, this may be the most thorough check-up and cleaning you’ve ever had! Take special care of your gums. Sometimes during orthodontic treatment gums are neglected because flossing takes so much longer. Put in some extra effort to get your periodontal health on track by flossing faithfully every day. You may want to gently massage your gums with your toothbrush if they feel a little tender. Give your teeth some time. Your mouth may feel strange for a few days. Some people report that their teeth even feel a little loose. Just take it easy for a few days. Take care of your retainer! Your retainer is your new best friend. We often see patients who need a second round of treatment because they neglected their retainer the first time. You’ve already put in all that effort, so make sure that you keep the dazzling effects for your lifetime! To really celebrate, take some fun “after” pictures showing off your new smile. Post them on Facebook! You may even want to think about some teeth whitening to make the most of your beautiful, straight smile. From everyone here at our practice, congratulations on finishing treatment! We’re so grateful that you chose us to see you through this process, and we’re so excited about your amazing new smile. WE TALK A LOT ABOUT TEETH, but not a lot about your tongue. Your tongue plays a vital role in your overall oral health! Did you know that your tongue is the fastest-healing part of your body? And without our tongues, we couldn’t speak, taste, or even swallow. The tongue is a special kind of muscle called a muscular hydrostatic. This means that it operates without any help from your skeletal structure, like an elephant trunk or octopus tentacle. Your tongue is a natural cleaner—it starts clearing out food on your teeth after eating. Not all of your taste buds are located on your tongue. About 10 percent of them are found on your cheeks and the roof of your mouth. Almost 50 percent of the bacteria in your mouth is on your tongue. That's why it’s important to brush your tongue for fresher breath! Taste buds are too small to be seen with the naked eye. Those little bumps on your tongue aren’t taste buds — they’re called papillae. Some people have pierced their tongues since ancient times, but there are serious oral health dangers associated with doing so, including chipped teeth and nerve damage. How many licks to the center of a Tootsie Roll Pop? Since 1970, Tootsie Roll Industries has received over 20,000 responses from kids around the world answering that question. Answers range from 100 to 5,000, but the average is about 700. Purdue University actually enlisted the aid of a “licking machine” to determine the answer. While the machines averaged at 364 licks, the human control group averaged 252 licks. Did you know that tongue twisters can help you overcome any lisping that might accompany wearing a retainer? Practice makes perfect, so give it a try! Do you have a fun tongue twister of your own to share? Comment below! Our team would love to hear it! Visit us on Facebook for more fun and office photos! 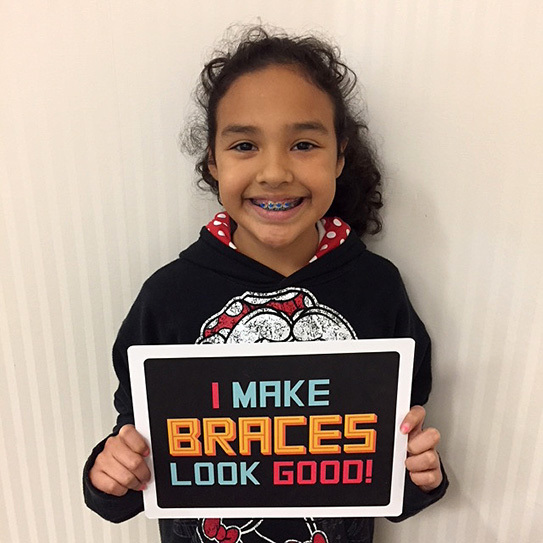 Thank you for choosing Gorczyca Orthodontics in Antioch, California. TIME FLIES WHEN you're having fun. 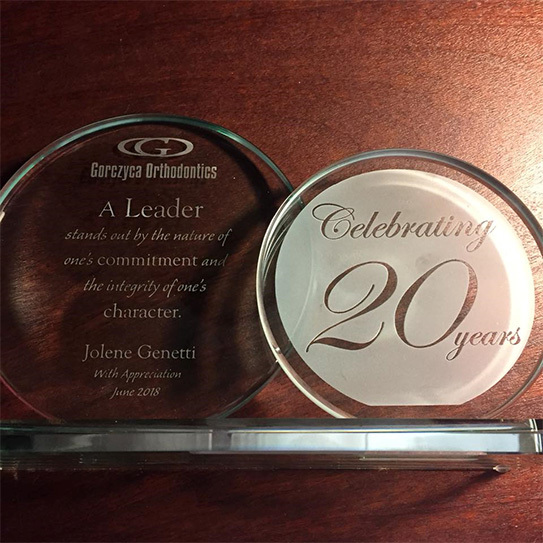 It’s hard to believe that Jolene has already spent 20 years with us at Gorczyca Orthodontics. It seems like just yesterday we were interviewing Jolene in our first office back on Lone Tree Way, Antioch, California. Jolene has been a backbone of Gorczyca Orthodontics for 20 years. 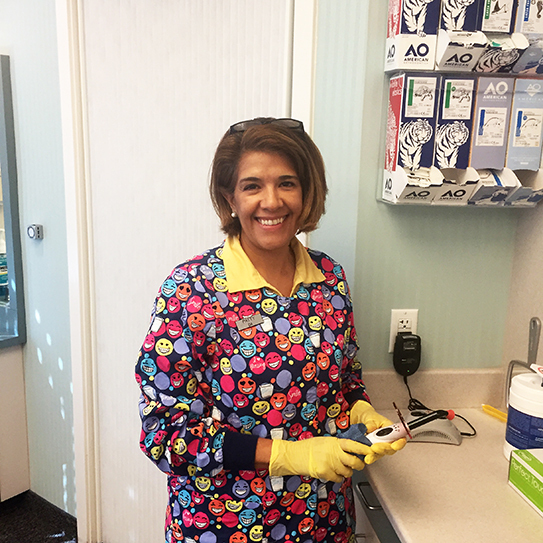 Jolene is also a 38-year RDA veteran, having worked in pediatric dentistry before coming to orthodontics full-time. Jolene’s excellence and experience as well as her outstanding customer service and love of her patients has made her a valuable asset to Gorczyca Orthodontics. We are thankful to Jolene for her loyalty and professionalism. We appreciate all that she does. 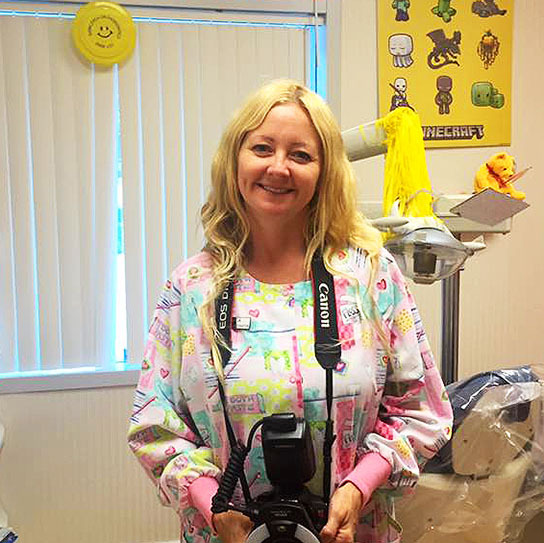 Over the past 20 years, Jolene has personally trained more than 38 dental assistants who have gone on to become registered dental assistants (RDAs) in orthodontic practices all over Northern California. 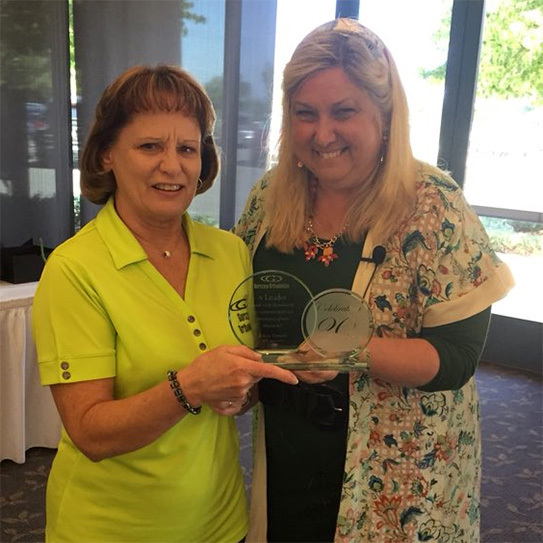 For her excellence and commitment to continuing education, Jolene was placed on the advisory board of Diablo Valley College, the college she once attended. Looking Forward To More Years Together! Jolene has no intention of retiring. Neither does Dr. Gorczyca. Both plan to keep on creating beautiful smiles for as long as they can. Thank you Jolene for all you have done for your patients and for all of us at Gorczyca Orthodontics. You are the best person we ever could ever have had for our organization. We are all so fortunate to be able to work with you for 20 years. WHETHER IT’S DONE consciously or unconsciously, nail biting habits affect people of all ages. On the surface, nail biting may not seem like a big deal. However, fairly severe consequences can result in both oral and overall health problems. And as if that wasn’t enough, it can also cause complications during your orthodontic treatment. Nail biting can crack, chip and wear down teeth. Your front teeth are lot different from your back teeth in terms of functionality. They aren’t designed for gnawing or chewing. Nail biting can shift tooth alignment and damage existing orthodontic treatment. Nail biting risks gum tissue damage. Bitten nail pieces can easily tear into your gum tissue increasing the risk of gum disease and eventual tooth loss. Nail biting can be expensive. The Academy of General Dentistry estimates that nail biters incur an additional $4,000 in future dental repairs. Nail biting can break your braces. The hard nail on your finger when pressed up against your orthodontic bracket with biting force could cause your orthodontic bracket to break and come loose. Did you know that teenagers are actually the most common nail biters? While 25 percent of young adults bite their nails and only 5 percent of older adults bite their nails, as many as 45 percent of teenagers have this habit. And for teenagers with braces, it can cause problems. Think about the most germ-concentrated areas of your body — your mouth and hands. You can imagine what happens when those two areas are in constant contact. And when there are even tiny, tiny breaks in the skin, germs get a free hall pass to your bloodstream. Yuck. Keep your nails looking nice. It will help motivate you to leave them alone. Enlist friends. Sometimes it helps to have someone remind you when you’re biting. Notice your trigger(s). Anxious? Bored? Learn to deal with these emotions in other ways. Carry a nail file and clippers. If you crack a nail or snag it, you can make repairs without biting. Treat your nails. There are many awful tasting products — designed for this purpose — that you can put on your nails to really deter you. Do You Have Any Helpful Quitting Ideas To Add? Do you struggle with biting your nails? Does someone you love bite his or her nails? We hope the content of this post has helped. Let us know if there is anything else our team can do to help, or if you have other questions. If you have any tips for quitting, share them below or connect with us on our Facebook page. We’re always excited to hear from you! Your smile and health are our inspiration. WE LOVE BEING your orthodontic health care providers and having you as part of our orthodontic team. Thank you for choosing Gorczyca Orthodontics. Whether it’s Roberta taking your initial office phone call, Veronica welcoming you for your initial orthodontic exam, Katie doing your initial orthodontic records, Gwen or Jolene putting on your new braces, or planning and delivering your Invisalign treatment with Dr. Gorczyca, we feel privileged to have you as a patient at Gorczyca Orthodontics. We appreciate you and cannot wait to see you back at your next orthodontic visit. We consider having you as a patient for life fun, and we look forward to hearing about you and your family and your activities. We care about you and want your orthodontic journey to be a great experience. We feel honored to also serve your family and friends. Than you for trusting us with your new smile. We look forward to giving you the smile of your dreams and delivering orthodontic excellence. You make Gorczyca Orthodontics fun and bring a smile to our faces. We cannot thank you enough for your referrals to Gorczyca Orthodontics. Your friends are our friends. Thank you for being part of our orthodontic family and team. Thank you for recommending us to your family and friends. Thank you for your 5 star reviews on Yelp and Google. You have truly touched our lives and we hope that we have touched yours. We invite you to let us know what we could do to make our orthodontic office even better in giving you the personalized attention you deserve. Please take a moment at our front desk to fill out our customer survey and let us know how we can serve you even better. Your smile truly is our inspiration. Images used under CC0 Public Domain license. Images cropped and modified from originals. FATHERS HAVE A KNACK FOR making us smile—even when we’d prefer to be grouchy! Amazingly, they can usually pressure us into smiling through a simple act or gesture—a grin, a proud look, a really dumb joke. This week, as much of the world celebrates Father’s Day, let’s return the favor! 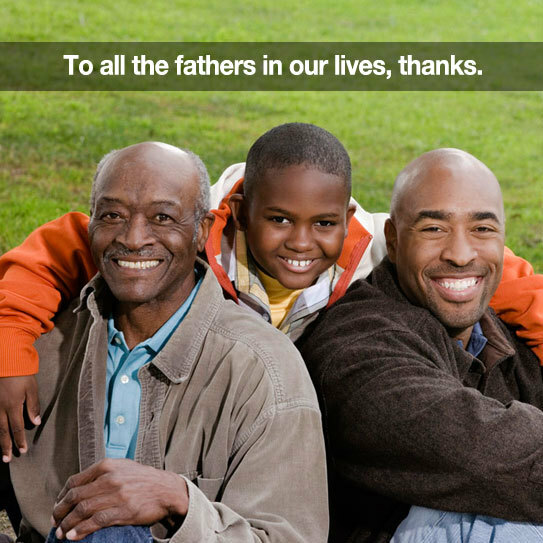 Help Make The Fathers In YOUR Life Smile! Now, think of one thing you can do for each of them this week that would make their lives brighter, make them smile, or lighten their loads. Remember, it could be something really simple like a unexpected visit or unhurried phone conversation to just say “thanks”. Whatever you come up with, make sure he knows how grateful you are for the role he’s played in your life. It isn’t every day that we get an opportunity to celebrate those fathers who have contributed to our success and happiness. Take advantage of the day. By helping these fathers smile, you’ll find yourself smiling as well. Oral-B did a great job in this video capturing the Power of Dad! Now Share Something With Us! Did you decide on some things you can do this week? Please share your ideas with us below! Do you have a memorable experience where a father in your life made you smile? Perhaps a great Father’s Day tradition? Share it with us in the comments section below or on our Facebook page. We’d love to hear from you. From all of us at Gorczyca Orthodontics, Happy Father's Day. Gorczyca Orthodontics, Antioch, California 925-757-9000 www.clubbraces.com. CLEAR ALIGNERS HAVE been a popular means of correcting crooked teeth for the last 20 years. But did you know that clear aligners can also correct your occlusion, front to back tooth relationship, and bite just like braces can? Simply attach your rubber bands to your aligners. With Class II cutouts or Class III cutouts and front to back rubber bands, your clear aligners can correct you bite just like braces. Additional tooth movements prescribed by your orthodontist into the aligner setup will also help you acheive your ideal bite. Every bite correction needs an orthodontist's diagnosis and treatment plan. You will need to see your orthodontist to receive this personalized sequence of tooth movement care. Here at Gorczyca Orthodontics in Antioch, California, we have been using clear aligners since 1999 and have created hundreds of beautiful smiles. Call us at 925-757-9000 is you have questions about clear aligners and would like to schedule a free exam. Find us at www.clubbraces.com. Whether Clear Correct or Invisalign, you can correct your smile today quickly, easily, and comfortably with clear aligners. Here’s to your beautiful smile. MANY PATIENTS TODAY are choosing aligner treatment for orthodontic tooth movement. There are many reasons influencing this choice, including appearance, ability to eat all foods, and comfort. Aligner therapy also eliminates the possibility of broken braces brackets or poking wires. For the busy professional or college student away at school, traveling, or living abroad, aligner comfort is a big factor for orthodontic treatment comfort consideration. There is however one tool you should include in your aligner emergency kit. That is a nail file or emory board. How Does An Emory Board Help? Just as with braces, your initial aligners may irritate your cheeks and tongue for a short time and will take some time to get used to. 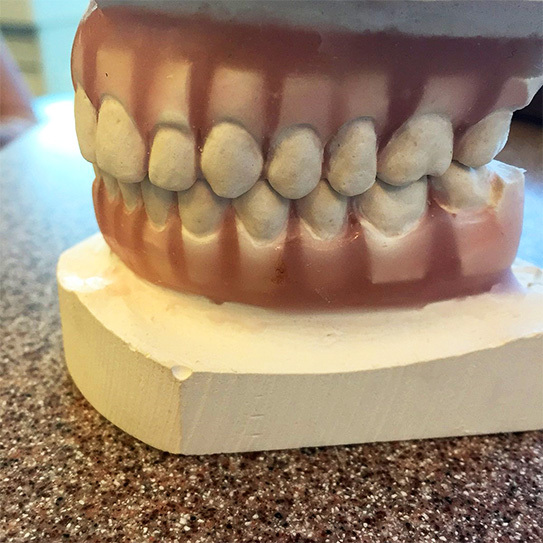 Aligner edges may slightly stick out due to the shape of your gums when they are originally scanned or captured in the initial impressions for your aligner tray fabrication. You can smooth any slight protrusion in your aligner with your sandpaper nail file to immediately increase comfort without making an emergency trip to the orthodontist. If you have questions about aligners, Invisalign, Clear Choice, or overlay clear retainers, call us at Gorczyca Orthodontics in Antioch, California 925-757-9000. If you are interested in aligner orthodontic treatment, call us for a free exam or visit our website at www.clubbraces.com. Gorczyca Orthodontics has been providing aligner orthodontic treatment with Invisalign since 1999 and we have several hundred very happy aligner patients. Here’s to your aligner orthodontic treatment and comfort! Your smile is our inspiration. Is It Possible To Over-Brush While You Have Braces? HAVE YOU EVER had a sip of ice water and experienced a sudden, sharp pain in your teeth? You’re not alone. One in eight people experiences tooth sensitivity—the kind of sensitivity that isn’t due to a problem such as a cavity, and has nothing to do with braces. So what’s causing it? Surprisingly, one of the most common causes of tooth sensitivity is brushing with too much force. While you’re undergoing orthodontic treatment, it’s more important than ever to brush! However, don’t interpret that as a recommendation to brush more aggressively. There’s a better way to be effective. Over-brushing is problematic because it wears down the protective layers of your tooth enamel. It can also push back your gums, exposing the dentin layer under the enamel even more. This dentin layer has microscopic tubes or canals that lead to your tooth’s nerves. If these tubes are exposed to hot, cold, or even acidic foods it can lead to discomfort and tooth sensitivity. Brushing too hard, especially at the corners of your dental arch, with a back and forth “saw action” may lead to gingival recession (gum recession, or receding gum height) especially over the canine tooth roots. This is one dental health problem we would like to avoid. Watch which direction bristles face when you brush. They should be perpendicular, not parallel. Hold your toothbrush loosely, like a pencil. Use soft, round motions to brush. Don’t saw back and forth. Use soft or extra-soft bristled brushes. Brush softly! Apply just enough pressure to feel the bristles against your gums. Braces may be hard on your toothbrush—replace it when you notice frayed and bent bristles. When it comes to cleaning teeth, elbow grease doesn’t do the trick. Consider this mantra: brush smarter, not harder. When regularly brushing, the plaque you’re trying to get rid of is fairly soft and can easily be brushed away with a soft brush. During the two minutes you’re brushing it’s good to be thorough, but there’s no need to scrub the same areas over and over again. Are you experiencing tooth sensitivity? Over-brushing isn’t the only possible cause. Some orthodontic patients may have exposed roots due to shifting teeth, not over brushing. If you are experiencing discomfort, ask us about it at your next appointment. You can also leave a question below, or you can ask a private question on our Facebook page. If you have questions about healthy tooth brushing, crooked teeth, or gum health, please visit us at Gorczyca Orthodontics in Antioch, California for a free orthodontic exam. Call us at 925-757-9000. 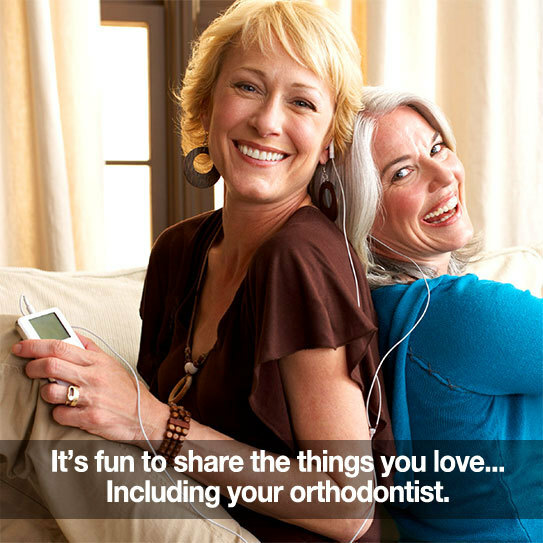 Find out more about Gorczyca Orthodontics at www.clubbraces.com. We look forward to you. Your smile is our inspiration. AFTER FINISHING LUNCH AT WORK, DO YOU BRUSH YOUR TEETH? A survey reveals that despite knowing that a healthy, attractive smile affects both personal wellness and professional image, very few people are brushing at the office. The survey, carried out by The Academy of General Dentistry and Oral-B Laboratories, polled more than 1,000 full-time employees about their oral care habits and the importance of a healthy smile at work. Their findings were very interesting. 96% of respondents thought a smile was very or somewhat important to a person’s appearance. 40% ranked “smile” as the first thing they noticed about a person at work. 32% cited “bad breath” as their co-workers’ least attractive trait. 3/4 of respondents ate twice or more a day at work. Only 14% brushed their teeth! The sugars and starches in the food you eat can cause an “acid attack” on tooth enamel. Even after the visible evidence of food disappears, plaque bacteria continues to grow. If you don’t brush, those workday meals, snacks, and beverages stay on your teeth and can increase the likelihood of tooth decay and gum disease. So brush! Let’s adjust the when of brushing just a bit, to your advantage: brush your teeth after breakfast, after meals at work, and before you go to bed. Leave a toothbrush at work and increase your likelihood of brushing by 65%! Step it up at home—the better you brush at home, the better you’ll brush at work. Take extra care to clean braces after (and store retainers while) you eat. If you already brush your teeth regularly at work, do you have any suggestions to help the rest of us, who may not be as valiant? Let us know in the comments below or on our Facebook page. If you would benefit from a new toothbrush to bring with you to work, ask us at Gorczyca Orthodontics about our easy travel oral hygiene kit. Your oral hygiene and dental health is our top priority. It is important to brush after lunch, especially if you have braces, Invisalign, or retainers. Stay healthy, happy, and brush after lunch. See you soon at Gorczyca Orthodontics, in Antioch, California. Your smile is our inspiration. 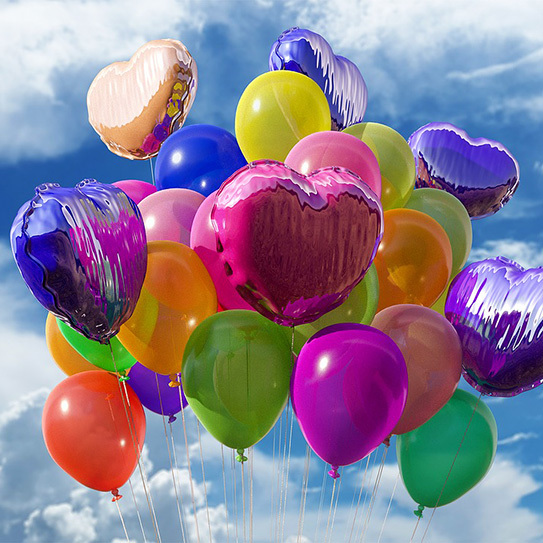 IT ISN’T VERY OFTEN that we get a chance to extend a big virtual hug to you, our valued patents and friends, for the trust and confidence you demonstrate in us each time you recommend our practice to your extended family members, neighbors, friends, and coworkers. Thank you. And thank you again. The new patients who discover our practice through their own trusted relationships (you! ), and their circles of influence tend to become our very best new patients. Whether you’re fairly new to our practice yourself or a long time patient, we hope you already know how much we love what we do and how much we appreciate you. We hope you sense that every time you visit us. If there is ever anything we can do to make your visits even more pleasant and comfortable, please never hesitate to ask. Feel free to share your thoughts in the comments section below and we will respond quickly. Also, by clicking on the Facebook link to your right, you can send us a direct message on Facebook any time. We appreciate your 5 star reviews on Yelp and Google. We also enjoy learning your suggestions for our practice. Please take a moment to fill out the customer service survey at our front desk. The highest compliment Gorczyca Orthodontics can receive is your referral of a family member, neighbor, coworker, or friend. 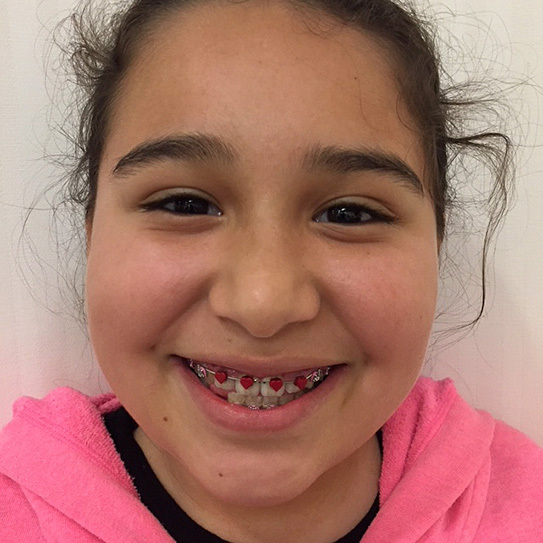 Thank you for choosing Gorczyca Orthodontics in Antioch, California for your braces, Invisalign, and retainers. IS A KISS RISKY WITH BRACES? You’ll have to answer that question on your own! Once in a while we’ll hear a story about braces getting stuck when two people with braces were smooching. But there’s a more-often-talked-about concern about kissing that our practice would like to briefly address below. We know it’s not pleasant to think about, but it’s true — your mouth is full of bacteria. Some of it is good and some of it isn’t. For the most part, your body (and your mouth, specifically) does a pretty good job of keeping bacteria, germs, and viruses that make their way into your mouth in check. But increased bacteria can also lead to increased plaque. Maintaining great oral hygiene habits is the very best way you can help your mouth do its job. Cold Sores. Cold sores are a manifestation of a herpes virus. Even when there are no signs, it can be contagious. Colds And Flus. Lots of viruses are included under the blanket “common cold” term. Colds happen, but you can decrease the spread by avoiding kissing while you’re sick. Mononucleosis. Also known as mono, glandular fever, or the kissing disease, this is caused by a viral infection that is easily spread by saliva and can knock you out for weeks. We’re not condemning kissing! Think about the benefits! Kissing increases saliva flow, which is great for your teeth and overall oral health. And of course, an affectionate peck can make you happier and strengthen relationships, which leads to better overall health and wellbeing. So don’t put the brakes on a great relationship just because you’re worried about germs! Just be smart, make sure that you maintain great oral hygiene, and that you always know who’s on the other end of that kiss. Any Questions About All This? We love answering your questions about ANY orthodontic or oral-health related matter. It gives us a chance to know you better. Give us a call, leave a comment below, or send us a direct message on our Facebook page. We’re always happy to discuss things with you! Give us a call at Gorczyca Orthodontics in Antioch, California (925) 757-9000. Thanks again for the trust you place in us! We value your friendship! AS VALENTINE’S DAY approaches, we are once again surrounded by one of America’s most popular candies, the conversation heart. First developed by a Boston apothecary in 1847, Oliver Chase joined the lozenge craze spreading through Boston. Innovating from mortar and pestle, kneading, rolling and cutting to make lozenges, Chase invented the first candy machine. Inspired by the Valentine card market in Boston, Oliver’s brother Daniel started putting food dye letters on to the lozenges in 1866. It is legend that the Chase brothers’ wafers with love greetings were sent to soldiers during the Civil War. In 1902 the heart shape lozenge machine was invented and the CRAZY4U conversation heart phenomenon was born. 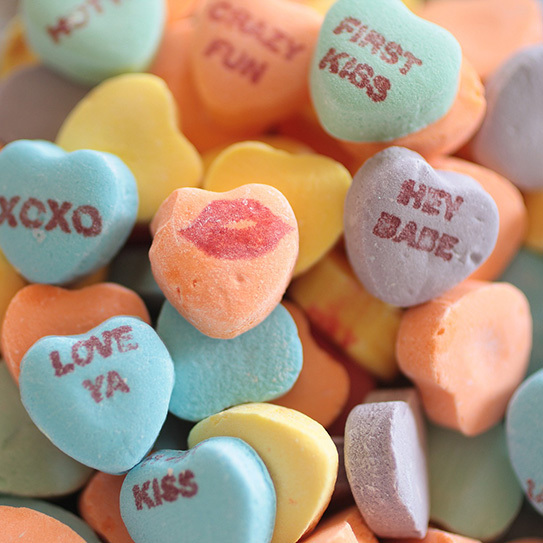 Daniel Chase went on to found the New England Confectionery Company (NECCO) which today makes 100,000 pounds of the hearts year round, each day. Through the years, conversation heart sayings have reflected how culture has changed. Sayings range from KISS ME, HUG ME, BE MINE, and CUTIE PIE to popular sayings likek TE AMO and GIRL POWER. For the digital age, we even have TEXT ME and TWEET ME messages. At Gorczyca Orthodontics, we would LOVE YOU to show your braces some SWEET LOVE by not eating conversation hearts. This will make Valentine's Day for YOU+ME the BEST DAY ever. Give out your conservation hearts and be TOO CUTE, TOO COOL, and find TRUE LOVE. We XOXO braces at Gorczyca Orthodontics in Antioch, California and want your Valentine’s Day to be extra special. We hope your conversation heart Valentine’s Day dreams come true. Find us at www.clubbraces.com or call us at 925-757-9000 for a free orthodontic exam. YOU ROCK for not eating conversation hearts with braces. Spread the conversation heart love and see you soon at Gorczyca Orthodontics. 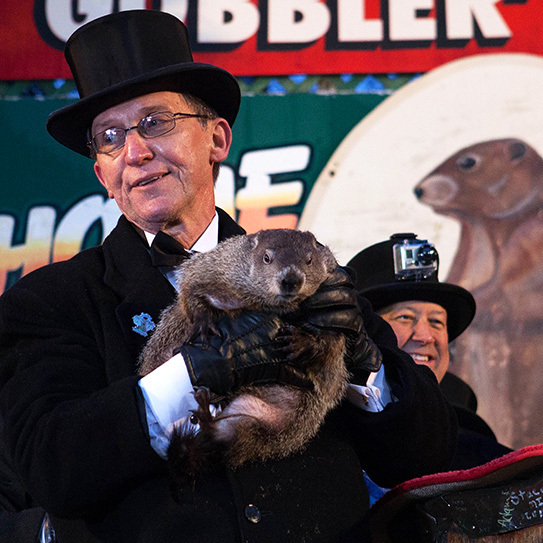 WE ALL KNOW the popular Bill Murray movie “Groundhog Day,” where Phil Connors wakes up in Punxsutawney, Pennsylvania and every day is February 2nd. He’s stuck reliving Groundhog Day and there is nothing he can do about it! Don’t get stuck in perpetual orthodontic treatment by not wearing your rubber bands! Breaking your orthodontic brackets over and over again makes each appointment a repair! This slows your orthodontic progress and makes you relive Braces Day over and over again! At Gorczyca Orthodontics, we are committed to moving your orthodontic treatment forward as quickly as possible. We closely monitor orthodontic elastic wear, motivate you, and get you in for emergency rebond appointments for broken brackets on quick notice. We want your orthodontic treatment to proceed quickly so that your braces will be off and you can spend your time eating whatever you would like and enjoying fun activities. We closely monitor your orthodontic progress and keep you informed so that you can move forward each day towards the end of your orthodontic treatment and receive the smile of your dreams as quickly as possible. Call us at Gorczyca Orthodontics 925-757-9000 if you have questions about the length or stages of orthodontic treatment. Find us at www.clubbraces.com or visit us at 5201 Deer Valley Road, Suite 1A in Antioch for a free orthodontic evaluation. We’ll make sure that your orthodontic treatment does not feel like Groundhog Day! See you soon at Gorczyca Orthodontics. Top image by Flickr user Anthony Quintano used under Creative Commons Attribution-Sharealike 4.0 license. Image cropped and modified from original. HOW MUCH SUGAR ARE YOU CONSUMING EACH DAY? Do you know? In many countries, the average can be well over 20 teaspoons per day! Sugar can be a major contributor to tooth decay. And, while we’re in the middle of your orthodontic treatment, it’s especially important to keep your teeth as healthy as possible. That way, when your braces come off, you won’t have a bunch of dental repair work that has to be done! Here at our practice, we’re interested in talking about every topic that affects your oral, your orthodontic treatment, and your overall health. There’s added sugar lurking in places you would have never guessed. “Healthy” cereals, ketchup, chips, and even spaghetti sauces can have tons of sugar. Be sure to watch the video below to learn how to equate grams of sugar into teaspoons. Also, watch for words like dextrose, sucrose, malted barley extract, and corn syrup when reading the ingredients list. You may assume that you’re eating healthier with that energy bar, smoothie, or yogurt. That may not be true. Take a careful look at the nutritional facts and sugar content before you make such things a routine staple. Half of your sugar intake may be in the things you drink. A major offender is soda pop, but be careful of fruit juices too. Everyone’s tastes and lifestyles are different, so experiment until you find YOUR OWN solution. Sweet tooth in the evening? For you, it may work best to satisfy the craving with a tiny piece of dark chocolate (eaten without guilt), and then promising yourself to brush your teeth immediately afterwards and not eat anything else before bedtime. Afternoon munchies? Cut up a bunch of easy-to-eat raw vegetables at the beginning of the week and keep them handy in the fridge for snacking. Also, drink more water! Sometimes (believe it or not) you think you’re hungry, but in reality, you’re thirsty. A tall glass of water can get you past a craving. Both sugar and starch are carbohydrates. Starches break down into sugars, so they can promote tooth decay. We hope you find these ideas helpful! Remember that by cutting back on sugar, you can better stave off obesity, diabetes, and of course, cavities when your orthodontic work is complete! What’s good for your body is good for your teeth too! Do you have any tips of your own for minimizing sugar? We’d love to hear them. Share them below in the comments section or on our Facebook page. Thank you for being our valued patient! Call us at Gorczyca Orthodontics in Antioch, California if you have question regarding your oral health, sugar, tooth decay, orthodontic treatment, braces, retainers, or Invisalign (925) 757-9000. Visit us at 5201 Deer Valley Road, Suite 1A for a free orthodontic exam. Find us at www.clubbraces.com. We look forward to seeing you! Your smile truly is our inspiration. ADD SOMETHING A LITTLE extra special to make you smile while you wear braces: designer ties! Express yourself and make a fashion statement at the same time. Whether it’s the smiley face, flower, star, or heart design, your designer choice and colors will show your personality every time you smile. Make your design pattern, color and style as unique as you are and smile in style! Designer ties make braces fun. Is It Time For Braces? The American Association of Orthodontists recommends that every child receive an orthodontic examination by age 7. Should your 7-year-old need braces, they are sure to have a bit more fun with braces designer ties. Call us today for the free orthodontic exam for braces at Gorczyca Orthodontics in Antioch, California (925) 757-9000. Find us at www.clubbraces.com and visit us at Suite 1A in the Deer Valley Dental Professional Building, 5201 Deer Valley Road, right behind Deer Valley High School. Come check out our designer ties. You and your child will love braces from Gorczyca Orthodontics. RECENTLY, MY ORTHODONTIC team members and I invited some referring lady dentist friends to join us in beginning our Christmas Holiday celebration together by attending the Ladies Holiday Dinner at the Holy Rosary Church in Antioch, California. After the beautiful dinner, which included being served by husbands and Christmas Carols sung by the Deer Valley High School Choir, the door prizes were given out. I visited the table of the happy Opalescence GO tooth whitening winner to introduce myself and explain how simple it is to whiten your teeth with Opalescence GO trays by Ultradent. 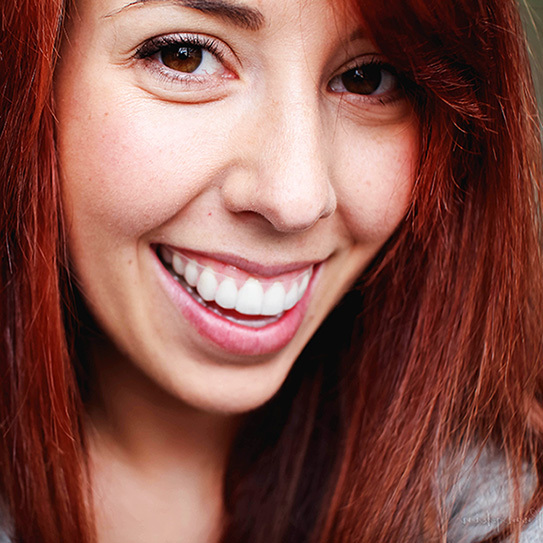 Simply place the preloaded whitening trays over the upper and lower teeth. After 20 minutes, remove trays, wipe teeth, rinse. Repeat each day until you’ve achieved the desired degree of tooth whiteness. All The Ladies Were Amazed! All the ladies at the winners table were amazed! They all wanted Opalescence GO whitening trays by Ultradent, available at Gorczyca Orthodontics or your local dental office. It’s that easy to whiten your teeth. So go whiten your teeth with Opalescence GO by Ultradent. IT’S EASY TO REMEMBER the character Count Dracula, a vampire, seen as a popular costume for both children and adults at Halloween. Dracula’s appearance is unforgettable as a thin, pale, tall man with a long nose, pointed ears, dressed in black, wearing a black cape. Although the novel Dracula is a work of fiction, it does contain historical references to Transylvanian-born Voivode Vlad III Dracula of Wallachia who reigned as ruler from 1456-1462. “Dracula” means “Son of Dracul,” Order of the Dragon knights, founded by Sigismund of Luxembourg (then King of Hungary). As an orthodontist, I’ve often wondered, did the historical figure Vlad Dracula have hypererupted maxillary canines? Upper side teeth (maxillary canines) that stick out too far (hypererupt) are common and affect 1-2 percent of the population. Because these upper canine teeth are the last teeth to come in at the front of the dental arch, they are the teeth that most often stick out. This is a serious orthodontic problem not only for the sake of appearance, but also because it may lead to these teeth getting stuck in the bone (dental impaction) or making the roots of surrounding teeth dissolve (root resorption), which could lead to tooth loss. This occurs when not enough space is available in the dental arch for the canine teeth. There also appears to be a genetic basis for this eruption phenomenon. The prevention of this “Dracula tooth” problem is to orthodontically create enough space early. This can be done by orthodontic dental arch expansion or tooth extraction, which is what we do at Gorczyca Orthodontics in Antioch, California. 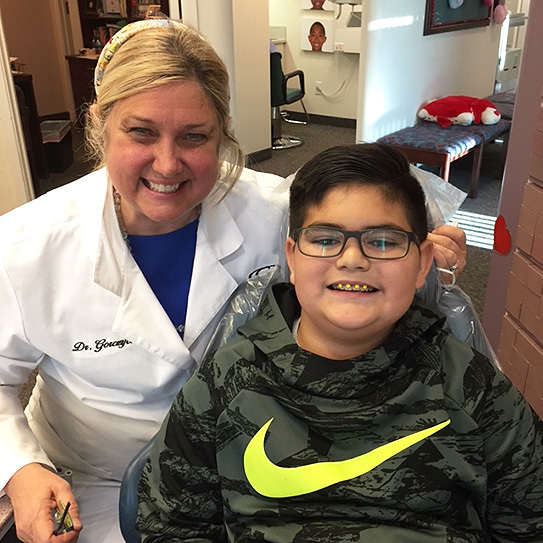 For this reason, the American Association of Orthodontists recommends that every child receive an orthodontic examination by age 7, and so does Orthodontist, Dr. Ann Marie Gorczyca. Count Dracula’s life could have been changed by early orthodontic treatment. Perhaps he could have grown garlic in the sunlight, lit more candles, smiled more often, married, had children, and lived happily ever after in his Carpathian Mountain castle! 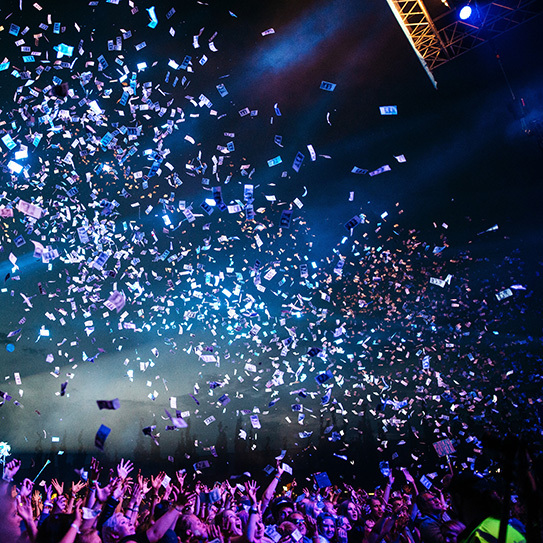 On Braces Debond Day, We Throw Happiness Around Like Confetti! YOU’VE WORKED HARD for a beautiful smile. On Debond Day, we want to celebrate all that you have achieved on your braces journey. We’re ready to celebrate your new smile happiness with you and throw kindness and smiles around like confetti. That’s why at Gorczyca Orthodontics, we schedule a special Debond Day each month to celebrate with everyone getting their braces off on their special day. This is a special day and one that you will remember for the rest of your life. We want to make sure it’s a great one. Our team of customer service leaders is ready to make this fun day memorable. We also want to say “Thank You” for choosing Gorczyca Orthodontics for your beautiful new smile. It has been an honor to serve you. It’s also been fun! Your Braces Are Off! Time To Celebrate! So, as you get your braces off, live it up! Sing a song! Let out a cheer! Hoorah! You’re braces are off, your teeth are straight and you look great! You’ve got a gorgeous new smile, the smile of your dreams! NOW, WE KNOW THAT we’re your orthodontic team, not your dentist. However, we want to help you have healthy teeth for life. And that job goes beyond orthodontics and into a lifetime of good dental care. That’s why we’re joining with our fellow oral health professionals to dispel the myths about one major dental procedure: root canals. We know that it’s a topic people don’t typically visit about in a favorable light. Root canal therapy has always been a bit of a “whipping boy” in dentistry—and, its reputation is probably undeserved. This is especially true given today’s awesome treatment advancements. The problems that lead up to needing a root canal can be painful because they affect your tooth’s pulp and nerves. Oftentimes people associate root canal treatment with the discomfort that made the treatment necessary in the first place. Don’t forget that root canal therapy is the solution, not the problem! And, root canals don’t need to be painful. Hopefully, with great home care habits and regular visits to your dentist, you won’t need root canal therapy at any point in the future. However, just in case it comes up, remember that there’s nothing to be worried about! Root canal treatment helps you keep your own teeth, and keep that beautiful, healthy, straight smile. If you have a toothache or are in need of a dentist or an endodontist root canal specialist, call us Gorczyca Orthodontics at (925) 757-9000 and we will refer you to the nearest dental professional to find a solution for your dental needs. We are located in the Deer Valley Professional Building at 5201 Deer Valley Road in Antioch, California right behind Deer Valley High School. We work closely with over 100 dentists and dental specialists in the greater East Contra Costa County area. Here's to your healthy and beautiful smile. Back To School! Are Checkups Part Of Your Checklist? ACCORDING TO THE AMERICAN ACADEMY OF PEDIATRICS, TOOTH DECAY is one of our most common, modern-day chronic diseases. In fact, by the time children begin kindergarten, 40 percent have some kind of tooth decay! Remember, just because your children, grandchildren, nieces or nephews aren’t complaining about tooth pain (and their teeth “look” OK), it doesn’t necessarily mean their teeth are OK.
Fall is a great time to assess your health goals and get back on track after a leisurely summer. Here at our practice we want to remind you how important your routine dental care is during your orthodontic treatment period. While we’re making your smile more beautiful, you need to be sure your teeth, gums, and entire mouth stay as healthy as possible. 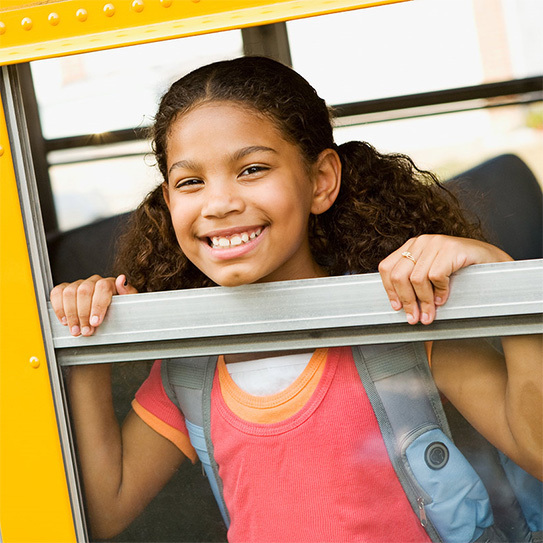 Be sure your regular dental checkups are part of your back-to-school checklist. Thorough Cleaning: Professional cleanings help prevent gum disease—keeping your teeth healthier, longer. Checking For Cavities: Take care of cavities before they become bigger problems, leading to pain and tooth loss. Checking Existing Dental Work: That includes fillings, crowns, sealants, etc. Examining Oral Tissue & Jaw Function: Early detection helps prevent oral cancer and related problems. Fluoride Application: For cavity prevention. Keep orthodontic work clean! Brush twice a day. Brush gently and pay special attention to your gum line. Teach your entire family the good habit of flossing each day. Eat healthier snack foods such as fresh fruits and veggies. Limit sugary snacks & high-carb foods. The bacteria that cause tooth decay love simple sugars—especially those in treats. If you like to chew gum, choose sugar-free options. Always talk with our team if you notice any unusual oral health changes or problems with your orthodontic appliances. A big part of our role is helping parents, grandparents, uncles and aunts better monitor children’s oral (and overall) health. Preventative dental care is one of the most important things you can do for yourself and for your family! So be sure to keep your regular appointments. 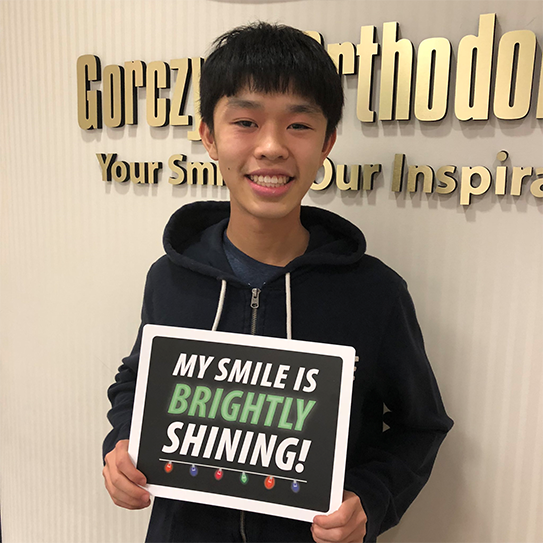 Thanks for being our valued orthodontic patient! Call us at Gorczyca Orthodontics 925-757-9000 if you need a dentist or pediatric dentist in the Antioch, California East Contra Costa County Area. We are located at 5201 Deer Valley Road in Antioch right behind Deer Valley High School. Thank you for choosing Gorczyca Orthodontics for your orthodontic needs. Your smile is our inspiration! We look forward to seeing you at your next visit! ACCORDING TO THE AMERICAN DENTAL ASSOCIATION as many as 10 million Americans are affected by serious eating disorders such as binge eating, bulimia, and anorexia. Most of you are probably somewhat familiar with these disorders and their dangerous health consequences. However, what you may not know are the many ways these disorders can harm your teeth and gums. Most people who are having difficulty with anorexia or bulimia are undernourished to some extent. One of the early oral signs of undernourishment is that gums and other soft tissue inside one’s mouth may bleed easily. Saliva glands may also swell and the person may experience chronic dry mouth. This condition can lead to a lot of oral health problems. As you know, stomach acids are extremely strong. If people having difficulty with anorexia or bulimia force themselves to throw up, that stomach acid repeatedly flows over their teeth which damages the enamel and can change the shape, color, and length of their teeth. The acid also makes teeth more brittle which makes them more prone to chip and break off near the edges. Here at our practice, we deeply care about the well being of every one of you—our valued patients and friends. If you or someone you love is struggling with one or more of these disorders, get help soon. Eating disorders are complex and arise from a variety of emotional, physical, and social issues. But there’s help out there—and as is the case with most such problems, early diagnosis and intervention can greatly improve opportunities for recovery. While in the process of getting help to overcome these problems, if you suffer from eating disorders be sure to do all you can to minimize the damage to your teeth and gums. Continue to maintain meticulous oral health care related to brushing and flossing. And if you throw up, do NOT brush your teeth immediately after—but instead, rinse your mouth with baking soda to help neutralize the effects of the stomach acid. BUT MOST IMPORTANTLY, seek help right away. True... We’re not psychologists. But, we DO care about your overall health as much as we do about your teeth. If we can ever help in any way, please contact us at Gorczyca Orthodontics (925) 757-9000 or find us at www.clubbraces.com. You can also ask questions below in the comments section or send us a private direct message on our Facebook page. Thanks for the trust you place in us. FOR A LONG TIME people associated the word “braces” with “teen”. But that’s rapidly changing. Today, 20% of orthodontic patients (that’s one in five!) are adults, and that number is increasing every day. Why? In part, people are realizing more and more that your smile can impact your career, your relationships, and your health! How Much Can You Know In 30 Seconds? We know that it comes off as shallow, but we can’t help making assumptions about people based on a first impression. It’s human nature. In fact, many studies estimate that it takes under 30 seconds—maybe even as little as seven!—to get our first “read” on someone. During those seconds, we guess how healthy, how popular, and how happy someone is. And despite what romantic comedies tell you, that first impression usually sticks! Another reason for the increase in adult patients is the fact that modern orthodontics has come a long way. Treatment is more aesthetically pleasing, more comfortable, and faster than ever before. 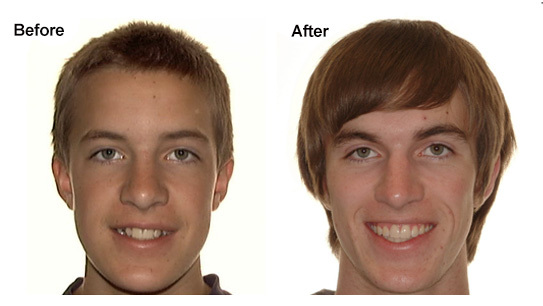 Folks hesitant to revert to the awkward teenage years can now get the smile results they want without compromising. You Haven’t Missed Your Chance! SO, if you missed the window as a teenager, or you find your teeth shifting later in life, ask us about adult orthodontics. The payoff of a healthy, straight smile will last a lifetime. It’s never too late to get a smile that you’re proud of. Call us at Gorczyca Orthodontics (925)757-900. find us at www.clubbraces.com or visit us at 5201 Deer Valley Road, suite 1A, in Antioch, California. Thanks for your trust in our practice. We appreciate great patients like you! Your smile is our inspiration. Top image by Flickr user tiarescott used under Creative Commons Attribution-Sharealike 4.0 license. Image cropped and modified from original. 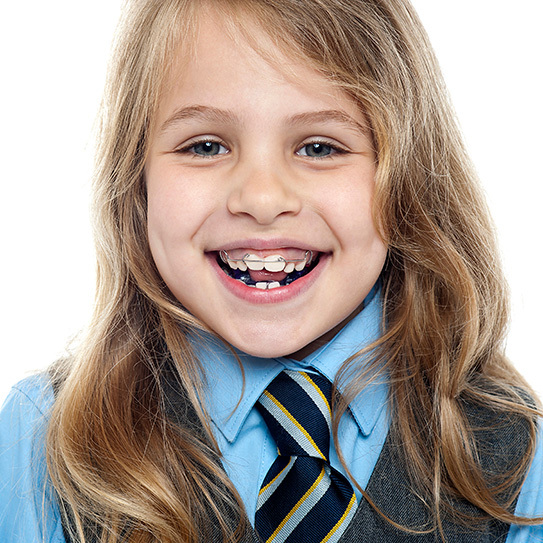 AGE 7 IS THE PERFECT AGE for a Phase I orthodontic treatment by an orthodontist. Phase I orthodontic treatment fixes bite problems when the mouth has 12 permanent and 12 baby teeth present. Early orthodontic treatment can prevent more serious teeth problems from developing. When Phase II orthodontic treatment is necessary at age 12, this treatment of all the permanent teeth will be faster and easier to complete. Orthodontists are able to achieve better results with Phase I Phase II orthodontic treatment in 15% of cases. Should treatment not be needed, the orthodontist will monitor tooth eruption and growth and development until all permanent teeth are present at age 12 and let parents know if treatment is necessary and the most appropriate type and time for orthodontic treatment. To find an orthodontist near you, visit the American Association of Orthodontists at www.mylifemysmile.org or visit us at Gorczyca Orthodontics in Antioch, California. Find us at www.clubbraces.com for call us at (925) 757-9000. There are good reasons for your child to have an orthodontic examination by age 7. Here's to your child's healthy smile. 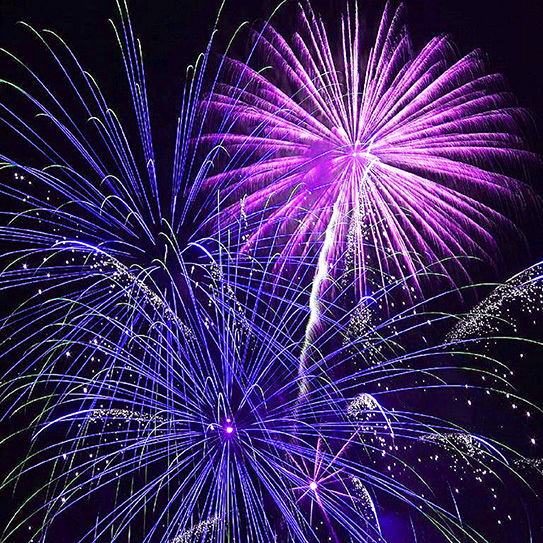 ON JULY 4, 1851, William. W. Smith held a picnic for the town residents of what was called Smith's Landing, at Smith's Point. In memory of his deceased brother, Rev. Joseph Horton Smith, William named the town which he and his brother had settled one year earlier, Antioch, California. Born in New Hampshire, the Smith brothers were itinerant ministers. Following the call of gold and intrigued by California, "The Paradise of America, where summer reigns perpetually," they sailed from Boston, Massachusetts to the San Francisco Bay. They landed on July 6, 1849 and on December 24, 1849, acquired a portion of land for $500 from Dr. John Marsh of Brentwood in return for starting a settlement. They never paid Marsh but settled the area just east of what is now downtown Antioch. On February 5, 1850 Rev. Joseph H. Smith died of malaria. W. W. Smith moved to higher ground overlooking the San Joaquin-Sacramento River Delta, to the area which is now First Street. W. W. Smith chose the name Antioch since it was where "the disciples were first called Christians according to Acts 11:25-26." The ancient city of Antioch is featured prominently in the Bible and was the third largest city in the Roman Empire following Alexandria and Rome. Previously in Syria, ancient Antioch is now modern day Antakya, Turkey. A stone monument marks the place where W. W. Smith welcomed a ship of the early settlers to Antioch on September 16, 1850. this monument sits at the foot of Kimball (F) Street. W. W. Smith was the true founder of Antioch. He died in October, 1899. Getting To Know Our Team Members: Spotlight On Dana! AS YOU KNOW, HERE at Gorczyca Orthodontics, we’re honored to have you as our valued patient! Our goal is ALWAYS remarkable, one-to-one patient care... Thanks to our amazing team members! Gorczyca Orthodontics is thrilled to welcome our newest Registered Dental Assistant, Dana. I am originally from Victoria British Columbia, Canada. I came to California when I was 27 years old and went to school at Huntington Dental College in Huntington Beach, California. I got married and started working in my first dental office where I met my husband who was a patient. I left that office to and started working as an orthodontic assistant in the office of orthodontist Dr. Gary Devian in Yorba Linda, California. I just loved it! After that, I always wanted to be an orthodontic assistant. When you’re not here working, what are your favorite things to do? On my day off, we like to go boating and camping. I live in Discovery Bay with my husband and son who will soon be 10. We like to wake board and ride dirt bikes. We live on the water so we get out on the water almost every day in the summer time. When you first started working here, what were your first impressions of the office and the team? Have those impressions changed? I think everyone at Gorczyca Orthodontics is very nice, helpful, and welcoming. We have a very happy team and working with the orthodontic patients is a lot of fun. What’s your favorite part of your job? I love seeing the patients start treatment from the beginning of orthodontics and make the step by step progress which truly tranforms their life. 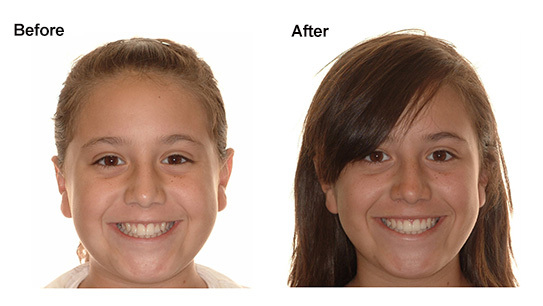 Not only are the teeth straight but their overall personally shows more confidence an happiness. It is a wonderful feeling to be a part of this and be able to give this gift to our patients. I will be doing the initial orthodontic records and final orthodontic records at Gorczyca Orthodontics. I will be working Tuesday through Thursday as well as Fridays. After the examination with Dr. Gorczyca, this will be the first step toward starting your orthodontic treatment. If you need to schedule your orthodontic records, please give me a call! We’re So Happy To Have Dana As A Member Of Our Team! and a Great patient experience. Thank you Dana for being part of our Gorczyca Orthodontics team! As one of our valued patients, if you have your own question for Dana, please ask in the comments section below! Also, you can always send us a message on Facebook anytime. We look forward to seeing you at your next visit! Thanks for the trust you place in our practice. WHEN I THINK OF DENTAL SPORTS mouth guards, I think of my cousin John. Always the scholar athelete, a few seconds without his dental mouth guard caused him to lose an upper front tooth while wrestling in high school. It has been reported that sports cause approximately 36% of injuries to children and adolescents. According to the American Dental Association, 10-20% of all sports related injuries are to the jaws and teeth. 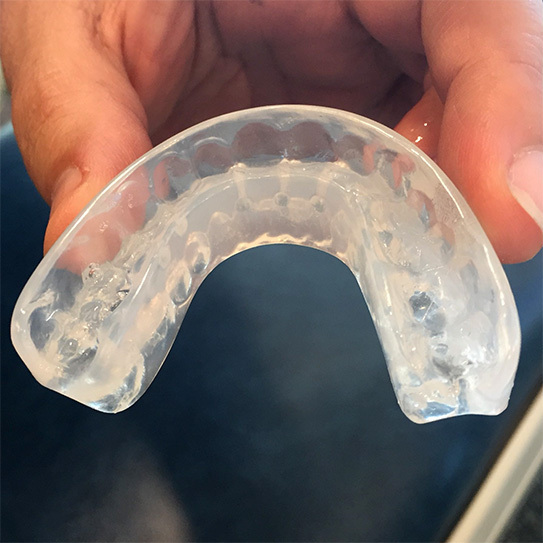 For this reason, Orthodontist Dr. Ann Marie Gorczyca of Antioch, California offers custom-made sports mouth guards at Gorczyca Orthodontics. Having recently returned from the office of Dr. Todd Yerondopoulos, Dentist of the Oakland Raiders, Dr. Gorczyca and her assistant Ashley are ready to serve local athletes in the fabrication of professional grade sports mouth guards. Custom designs are also available for Deer Valley High School, Antioch H.S., Pittsburg H.S., as well as Liberty, Freedom, and Heritage High Schools in Brentwood, California. Our goal is to prevent sports related dental injuries in our East Contra County community. But What Ever Happened To Dr. Gorczyca’s Cousin? What happened next to Dr. Gorczyca’s cousin is the stuff of dental legend. Making the best of the situation, John visited Boston University Dental School for his dental implant, where he became the patient of a beautiful and charming dental student named Maria. He was so impressed with her passion for dentistry and his love for his new dental implant that he decided to marry her! Thirty four years later, John is the father of three and a leading orthopaedic trauma surgeon, making for a romantic ending to this “toothsome” tale.